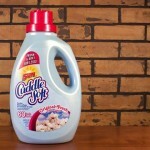 The Fabric Softener Fix for Stripping Wallpaper! On August 28, 2015, we finally closed on our home in Fruitport, Michigan. Being a short sale, Patrick and I had been waiting since late February of that same year to sign the documents, solidifying the closure. I knew it would be months before we could move in, even after the closure, but that was the least of my worries. We were inching closer to our ultimate goal of remodeling a home. Standing two stories tall, half brick-half vinyl siding, attached garage, on just shy of an acre, seven bedrooms, and three and one-half baths, we were eager to start our adventure in reconstructing and cosmetically reconditioning a three thousand square foot, 1970’s retro home. A twenty foot dumpster had barely enough space for all the garbage and debris we removed from the home. White ceramic tile and soiled carpet had been pried and stripped from the floors; drywall torn down in the master closet, living room, basement, and upstairs spare bathroom; three layers of shingles had been removed from the roof surrounding the fireplace. Yet, despite all this, the most agonizing and time consuming demolition project was still ahead: the removal of the wallpaper! Throughout the whole process, my most valuable resource was Patrick’s mom, Phyllis, and her sister, Aunt Diane. 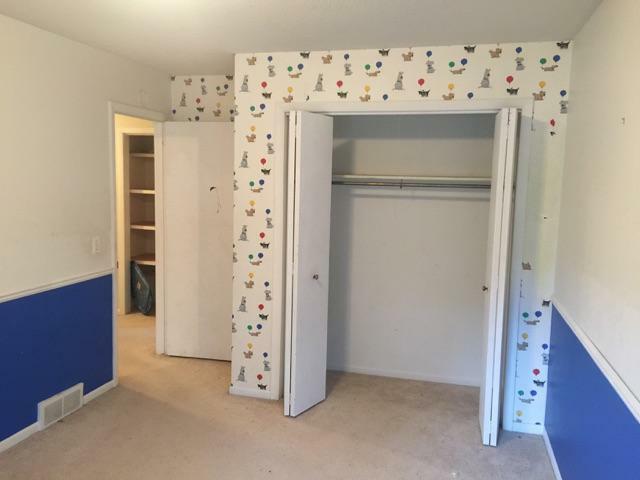 Thanks to their much-appreciated help, we were able to remove the majority of wallpaper from six walls, including the kitchen, two bedrooms, a master walk-in closet, and two bathrooms in two days time. However, even though we got the job finished in the end, it wasn’t without some complications. 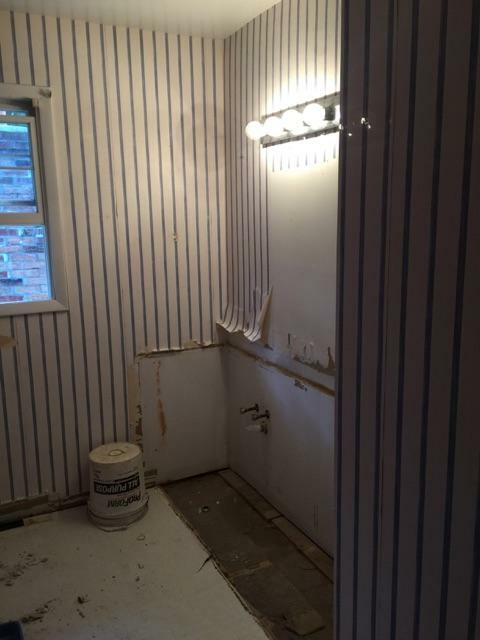 In fact, after many “oops” and a bunch of experimentation as to what solutions and tools to use, it occurred to me that stripping wallpaper was going to take a lot more time and patience than I had anticipated. Who knew that dogs of all shapes and sizes holding balloons could be so intimidating? (see the photos!) It only took us three walls of peeling quarter-sized paper pieces, one-by-one before I was found myself ready to defeat. It was around that time, at the moment of near despair, that we decided to shift gears and try something different. After reading somewhere that fabric softener actually helped in the process of removing wallpaper, we decided to give it a try. After all, what was there to lose? So, in a yellow garden Sprayer, we combined 1/2 gallon of SUPER hot water (though not quite boiling) with 1/2 gallon of fabric softener (we used the least expensive!) along with 1 cup of DIF Concentrate Wallpaper Remover. Using a PaperTiger by Zinsser, I scored the wallpaper in circular motions. And here, I’d like to urge a little caution: I cannot stress how important it is not to press too hard when scoring. Using too much pressure with the PaperTiger can easily result in damaged drywall. Light to medium pressure works just fine. To prevent damage to our sub floors, we used Blue Painter’s Tape to stick plastic sheeting to the top lip of all base boards to catch excess solution that dripped from the walls. Anyway, once we had all the prep work done, we sprayed our new solution onto the walls and let it sit for 20-30 minutes, then scraped it off using a variety of different wallpaper scrapers and putty knives. The paper came off with remarkable ease and we realized we were finally closing in on finishing the project. 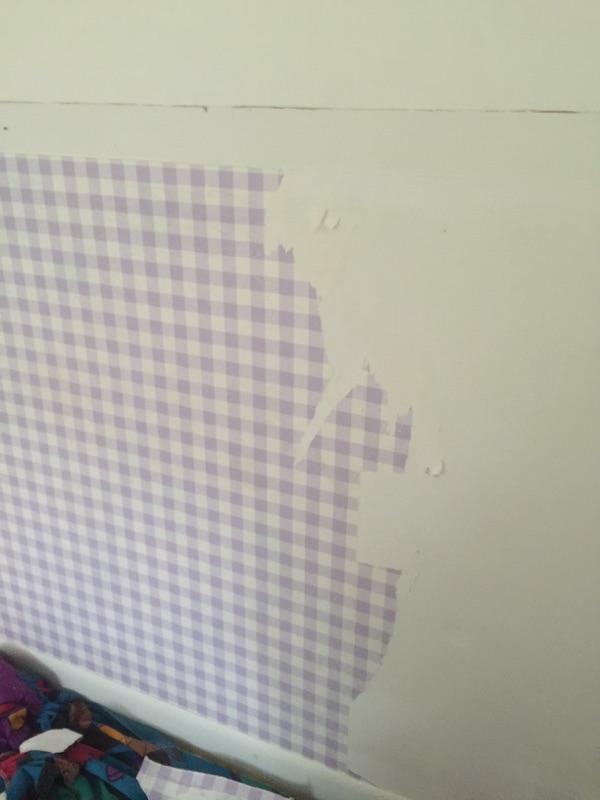 A second application of solution was applied to clean what residual glue was left after the wallpaper had been peeled away. After a final wipe down using a sponge and hot water, the walls were left to dry. 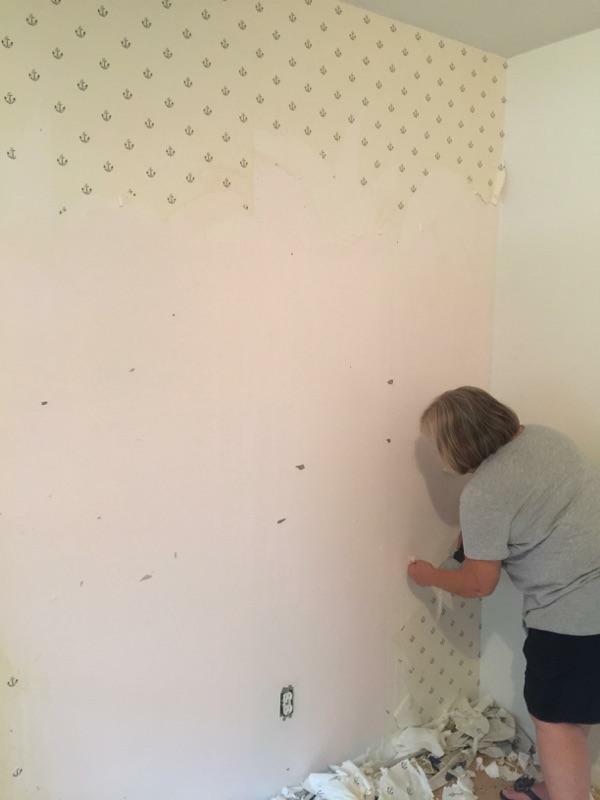 Removing wallpaper isn’t typically an easy or fun project, but with the right tools, a little elbow grease, and the right team of determined women (in our case!) you can get it done in a short amount of time. For us, when all was said and done, we celebrated our accomplishment with a well-deserved Mr. Scribbs pizza and I found myself considering the next step in this renovation!